Me: I'll be right back. Mommy has to pee. Me: I just told you. Weren't you listening? Funny to me because 1) I totally expected her to answer "Yes" not "No," and 2) she follows me around asking what I'm doing and if I'm ok ALL.DAY.LONG. Laugh or cry? I choose laugh. So adorable I had to share. 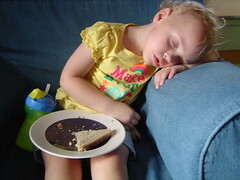 Does it count as a sugar crash if she doesn't finish the sandwich? Want to send a card to a woman with Down syndrome for her 50th birthday? I've looked at Snopes (found nothing) and Googled (just links back to the same post I'm sending you to), so I have my fingers crossed and my heart open that this is true. You need to go to My Blessed Life's post and comment to get involved and get the address, so I'm just going to send you there to read the story. Join in or don't, but we are going to send a card as soon as Myra sends me the address.